The prospect of full time van life is something that many weekend warrior travellers and off grid adventure enthusiasts think about every single day. Living the van life gives you so much freedom and opens so many doors that you never even knew existed, and it’s safe to say that it will change your life forever. One of the best bits of my job is that I get to speak to other people who are living the same lifestyle on a regular basis and share their highs and lows. 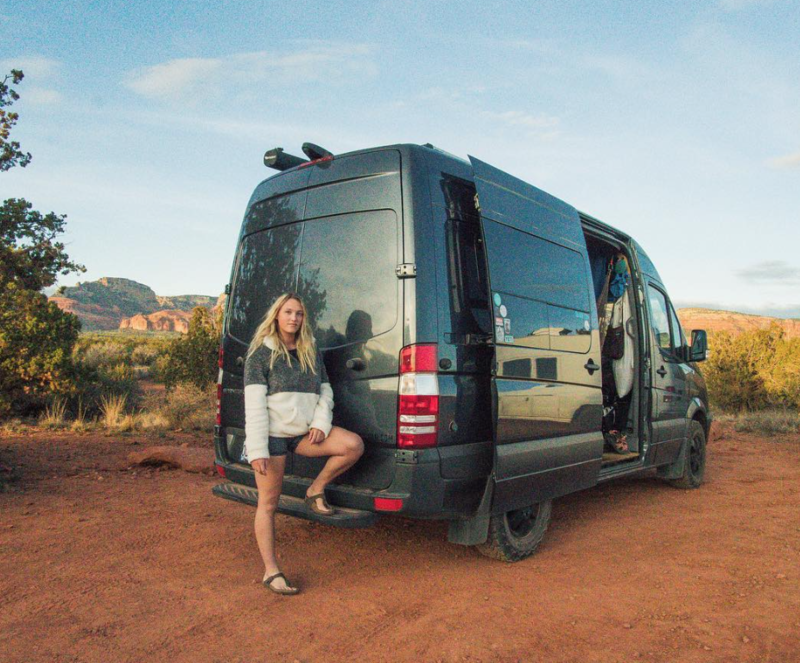 Meet female traveller Katie @soweboughtavan, one of our favourite girls off grid and an inspirational figure in the van life movement. Take it away Katie! Are you an avid van lifer or a hardy weekend warrior? Join our new Facebook Group and keep in touch with our ever-growing community! 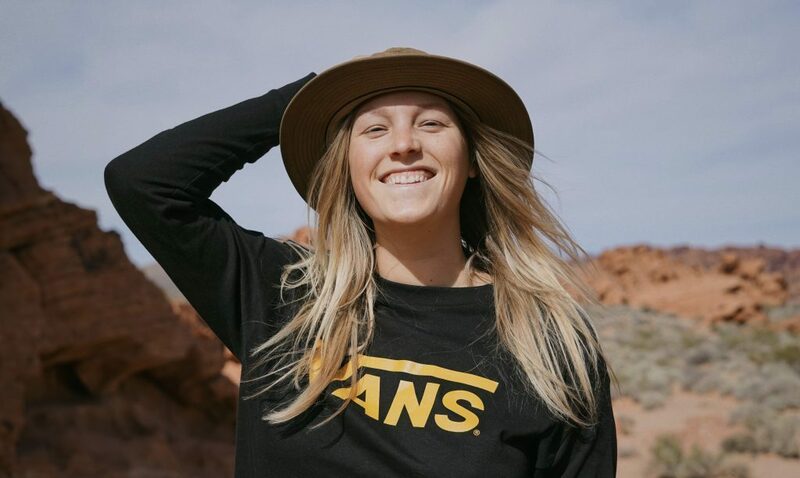 Female Traveller Katie Lives And Breathes The Van Life! Hey Katie. Tell me a little bit about yourself and your adventures! 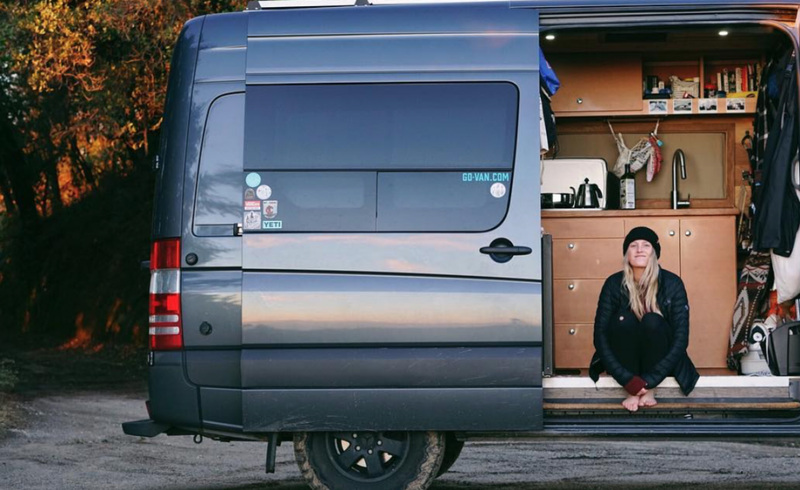 Do you live in your van full time, and has your lifestyle changed at all now that you’re a full-time female traveller? Before living in a van, I attended college and got my degree. 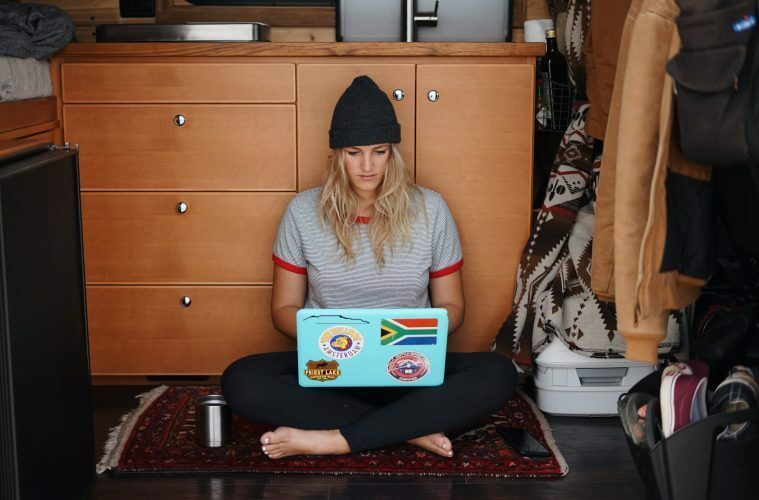 After completing an internship abroad in Cape Town, South Africa, I came back to the states, ready to dive into a full-time job. I worked for about 2 years in Association Management for a small company in Portland, Oregon. It was a pretty strict schedule with some overtime/weekends and a lot of hard work. While I loved the work I was doing, I definitely felt constricted to a tight schedule, professional dress code, and heavy management. I felt like my life revolved around work and I didn’t have the free time for many other hobbies/activities or to even spend the money I was making. I’m so grateful to be involved in remote work now and the freedom that planning my own schedule provides, in addition to being passionate about the work I’m doing. Why did you decide to get a van and become a traveller? There is also so much freedom that comes along with my life as a female traveller living in a van. You cut out the “travel time” because you’re just moving around in my home. I’ve been able to see and explore so many states, National and State parks, monuments, everything. I’m excited to continue the digital nomad lifestyle as a female traveller, visit new places, and return to places that I fell in love with in the past year. I don’t know how anybody steps away from this lifestyle once they’ve experienced it! Tell me about your van; which bits do you love and which don’t you like? I drive a 2016 144” WB Mercedes Sprinter High Roof. We bought the car new in October of 2017. We worked diligently while still working full-time jobs to convert the entire van, which took just over 6 months. It was a lot of work but I’m so happy we chose to do the conversion ourselves. Everything is hand-built with every single detail created exactly as we imagined it. I have a custom size bed (a bit wider than a queen but shorter than a queen), plenty of cabinets for clothing and food, a 2-burner propane stove, running water and a sink, a small portable toilet, a small fridge (basically a mini-fridge), and a bunch of storage space underneath the bed in the rear of the van. I love that the build is functional for everyday living. When you enter the van, the general kitchen/standing space is very open, with access to almost every drawer. The one thing I wish I had was some sort of bench and table, at least more stationary. I have a small tripod table I can set up but I often get lazy and just work on the floor or the bed. Having a more designated “workspace” would definitely be helpful for remote work if I was to ever convert another van. 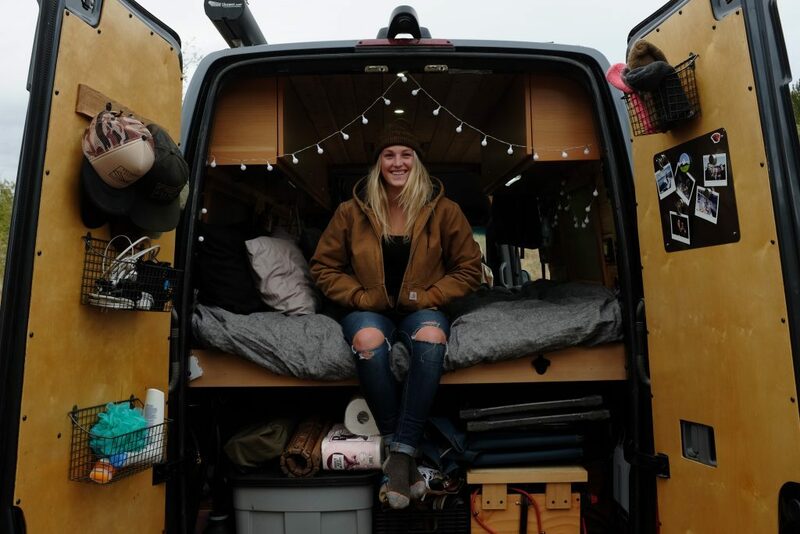 Tell our readers about the conversion process that your van underwent as you made the leap to becoming a female traveller. The hard part about Mercedes Sprinter Conversions is that nearly every wall curves. It’s hard to build the interior of something that isn’t square! There was a lot of custom work that went into the entire build, with some pieces literally carved with a hand-held jigsaw. The wiring was also a bit of a since there wasn’t any prior experience. Now that I’ve done it once, it’s definitely not as scary or as hard as I thought it would be, but it does take a lot of brain power and thought. The best part is that, since we did the conversion ourselves, we were able to build our dream van. We didn’t have to pick between somebody else’s layout options. The entire design is our own, down to the small details in the cabinets, kitchen layout, etc. Once the hard part of the van was complete, adding the final touches that make it home was also really fun! Picking out the curtain that separates the cab from the front, designing the window covers, adding a hanging fruit basket and plant holder, etc. My partner at the time had some prior building experience. Just having a small background with building and woodwork really makes a difference. We did have to learn a lot along the way, though, especially about the electrical system (wiring and solar). 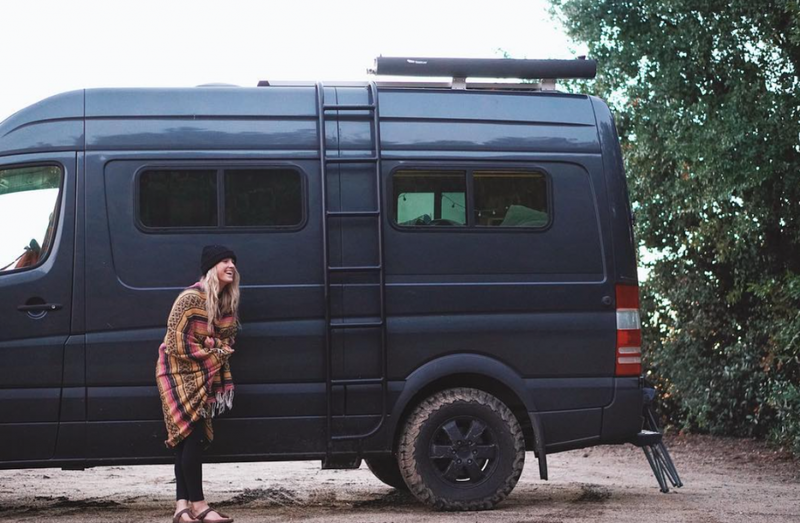 We spent countless hours watching YouTube videos, reading blog posts, searching through Van Life Instagram accounts, and asking other vandwellers various questions. It’s definitely a lot of work but worth it to do the research! What were the most important aspects of your van and your female traveller lifestyle? We had a general timeline, a semi-set budget, and a pre-designed layout when we started this project. Something I knew I wanted was a big enough electrical system that I could be off the grid without sun for 5 days, and I also knew that having a stationary bed would be important to me. We did SO much research for every single step along this process and, although it was a huge amount of work, it was well worth it. Tell me about how much time you spend in your van and what this time means to you as a female traveller? While I really consider this lifestyle living “out of a van”, it’s important to mention that yes, I do spend a fair amount of time in my van. Unless I am out hiking or exploring a State/National park, I am in the van, at least in some capacity. 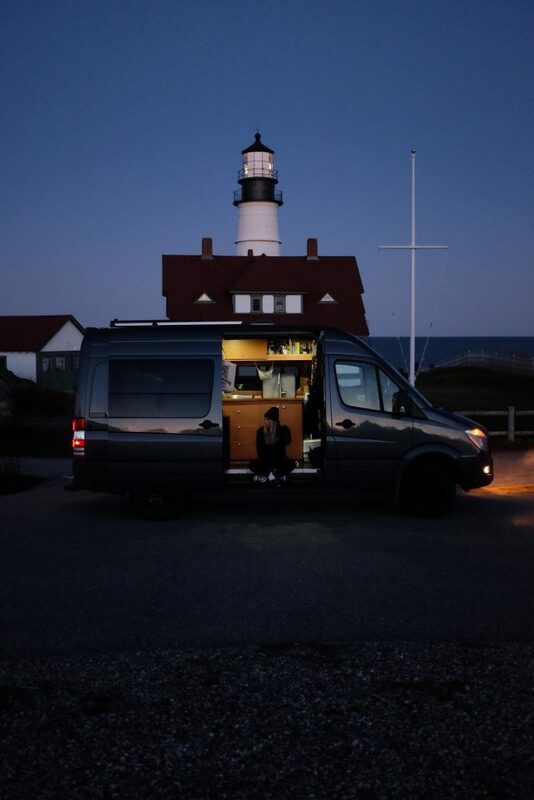 I drive a lot, as I travel at a pretty fast speed, so it was important for the van to be home-y but also spacious enough to be functional and not drive myself crazy. Once I set up camp for the night, I try to spend as much time outside as possible, whether that means cooking outside, having a campfire, setting up the camping chairs while I read, etc. Even when I am inside the van, I usually have the doors open, as I like to camp on public lands and have the option for fresh air throughout my home. I’d say the amount of time in vs. out of the van is probably 60/40 (more outside), if not 50/50. Once I started working remotely, I definitely started spending more time indoors for the sake of phone calls, keeping my computer safe/clean, and being close to the wifi hot spot. What does your van enable you to do as a female traveller? The biggest thing my van enables me to do is have freedom! I am able to explore and simply pick up and go whenever I want. I want to see a place? I drive there. It also allows me to be spontaneous, as I don’t have to plan ahead very much. I don’t need to make reservations, or book a ticket, or meet a deadline. I really travel at my own pace and my own convenience. After I finish a hike, I can truly just take off my shoes and pass out for a quick nap. I’m able to pay attention to my wants and needs so thoroughly, and simply do what feels good to me in that moment or on that day. Like I said, in my opinion, it’s the most convenient form of travel by far! How do you feel being a solo female traveller in a van? Do you feel safe? Are there any challenges you’ve had to overcome – physically or emotionally. I’m lucky to say that I’ve felt safe throughout my entire experience of living in a van. With that said, I pay attention to my intuition pretty well. If something feels weird or off, I leave or remove myself from the situation, however I can. Sometimes this means driving further at night, even if I want to just go to bed. It’s important to be self-aware and really follow your gut in a situation. While living in a van is honestly wonderful most of the time, it can be challenging and take a toll on you emotionally. You really have to pay attention to your mind and body. Getting proper exercise, drinking enough water, eating nutritionally, staying active mentally, are all really important when living in a small space. It’s one of the reasons I started working – I needed to feel motivated and like I was setting goals for myself because I was beginning to get a bit stir crazy. And never be afraid to just take a walk and get out of the van if you need some open space! 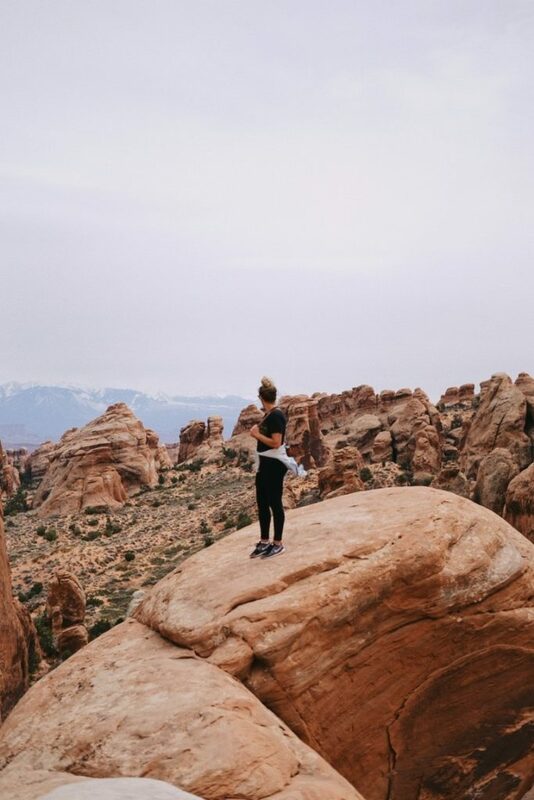 Are you a solo female traveller, or do you travel with a partner or friend? For just about a year now, I’ve been traveling alone and continue to do so solo for the long haul. I absolutely love it. I’ve dealt with things I’ve pushed off in the past, and have nobody else to report to. I truly get to do whatever I want, whenever I want. The choice is all my own. Additionally, the silence allows me time to be with my own thoughts and create open space for myself. This has heightened my self-awareness, self-growth, and ability to really build a relationship with myself. I’ve never felt more comfortable with who I am than I do at this point in time. 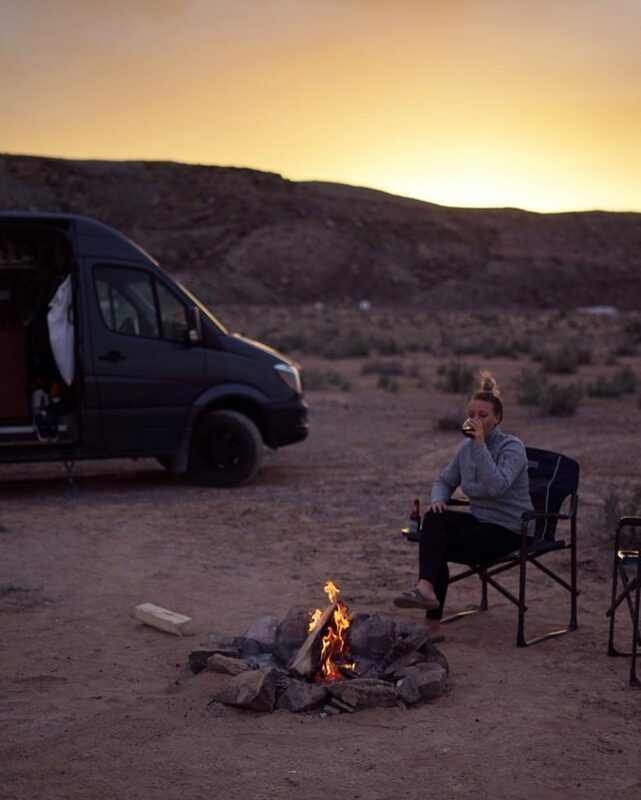 Do you think your time spent in the van and your adventures as a female traveller have changed you as a person, your goals and aspirations or your outlook on life? Everything has changed! Growing up, I just saw one path for myself: go to college, work an 8-5 job, get married, buy a house, and have children. I never knew there was any other way of living. Travelling in a van full-time in the van as a solo female traveller has really opened my mind to possibilities and so many more dreams I never even knew I had. I’m so less strict on myself and I really feel like I’ve been able to stop limiting my goals and dreams. I’m much more present in the moment and aware of what feels GOOD to me on a daily basis. I pay much more attention to my mental and physical health, as well as what makes me truly happy. It’s a really nice place to be in life and I feel so lucky that I was able to go through this life-changing experience. I also see travelling as much more attainable now and definitely plan to continue some sort of nomadic lifestyle throughout my future. What does your journey look like, and are you a full-time female traveller? I am full-time, yes! I spent a year on the road with my ex and visited all 50 states and even a bit of Canada. Since then I’ve been back to Canada, as well as all over the US by myself! My route is sometimes planned a day or two in advance but definitely is fluid and changes a lot. I may have certain places I need to be in a few months but I really try to keep my travel schedule as open as possible, to just make space for life. I’ve driven across the country more times than I’d like to admit, and in and out of Canada multiple times, experiencing Vancouver, Yukon, and even Quebec. The first month in the van was also spent far North in Alaska! As previously stated, I’ve now been to every state (more than once) and hope to continue visiting new places each time I return. What’s the best thing about vanlife and being a female traveller, and what don’t you like so much? The best thing is definitely the freedom. I get to wake up every morning, see what kind of mood I’m in, and make decisions about my day based on my current wants and needs. I also love never having to pack a bag anywhere I go. I have all my belongings right at my fingertips, which makes visiting different states and climates a breeze. One of the things that can be hard, particularly because I work remotely, is finding service. A large amount of the National and State Parks don’t have service, and I spend a lot of time in these parks. It can be hard when I have a work deadline and I have found myself driving to find service for a particular project. 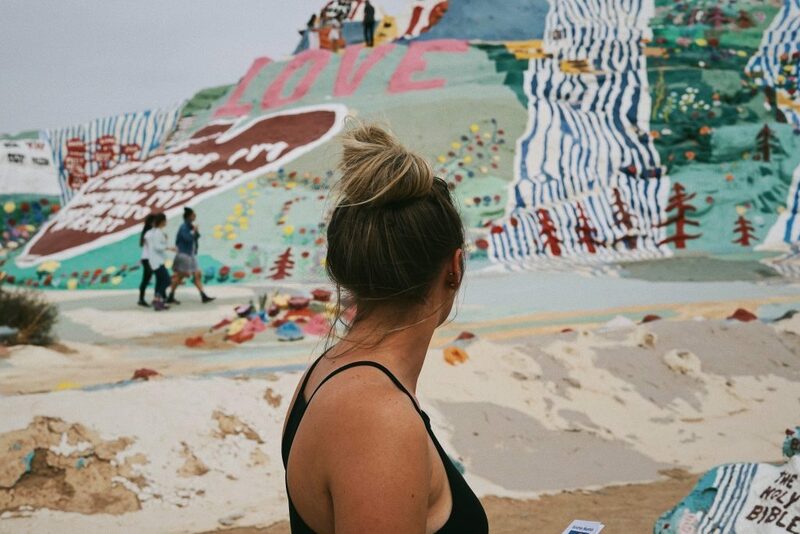 Additionally, visiting non-friendly RV cities can be challenging. Overnight parking is completely banned in some cities, enforced by local officers due to city ordinances. This can be really hard, especially when you’re just trying to find a place to sleep for a night while passing through. Overall, I try to be respectful of city laws and stick to public lands (BLM and National Forest) whenever possible. What are your van life essentials? A few that come to mind are a good Bluetooth, portable speaker. I like listening to music around the campfire or when I cook. I also invested in a good “bathroom” shovel for outdoor uses, which is so much better than trying to dig a hole with rocks or your hands (haha!) I always keep an atlas, in case I don’t have service, to ensure that I can get to my next destination. Lastly, I heavily rely on the RV All Stays app, which shows me everything from free camping van life travel park up spots to RV dump stations, to places I can refill propane and locations of available showers. I use this app every single day and I can’t imagine being on the road full-time without it. I have a few van gatherings on my schedule for the summer, which are always amazing. I would really love to explore more of Oregon and Washington, both states I grew up in/near but haven’t explored heavily in the van. I also have a trip booked to Nepal, to complete the Everest Base Camp trek this fall. Overall, I look forward to continuing to visit new locations, both in America and internationally, and revisit places I fell in love with on the road. I primarily stay on public lands in primitive campsites. I have only paid for campsites a handful of times because it isn’t sustainable on my budget. For the most part, public lands are easily accessible and very open to overnight camping! 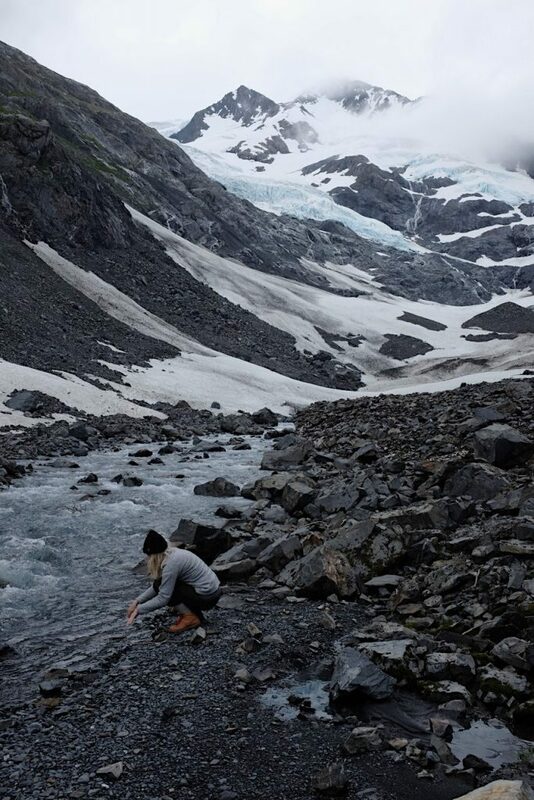 It’s also the reason I set out on this journey – to be outside, hike, camp, enjoy campfires, and just connect with the outdoors as much as possible. I like the freedom and privacy of primitive campsites too. It’s just me, the van, and whatever landscape I’m parked on for the night. I am lucky in the sense that I don’t require any hookups! I really am self-sustainable in the van. I have running water, a propane stove, a portable toilet, pretty much everything I need. I wouldn’t even need hookups if I had them available! Treat yourself to some of the best campervan gifts on the market! The Owl Car Cam is the only camper security system you’ll ever need. These small travel trailers were made for off grid living.